I have to constantly remind myself of this all the time. 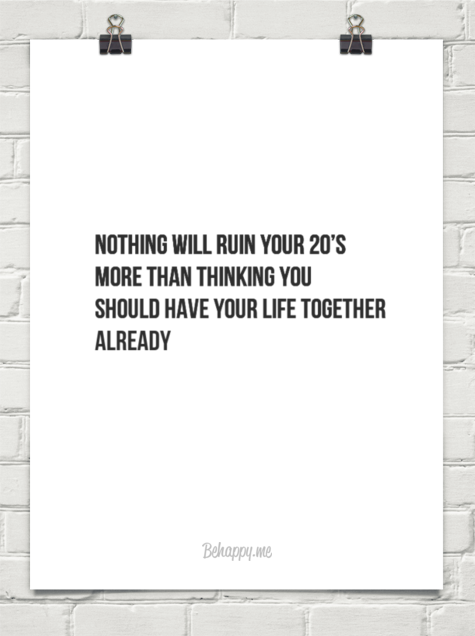 Your 20s are your time for trial and error. Go for your dream job even if you realize it’s not really what you’re passionate about. Start a business even if you think it might fail. Travel the world even if you’re tight on money. Take that chance on love even if it doesn’t last forever. Make mistakes. Fall and get back up. Learn the rhythm of your heart. Figure out what makes you tick. Go wherever you feel God leads you. Don’t listen to the people that will try to tell you to settle for the safe choices. You have the rest of your life to have it together. Let your 20s be the years that you fumble, fall and figure out what your purpose is.